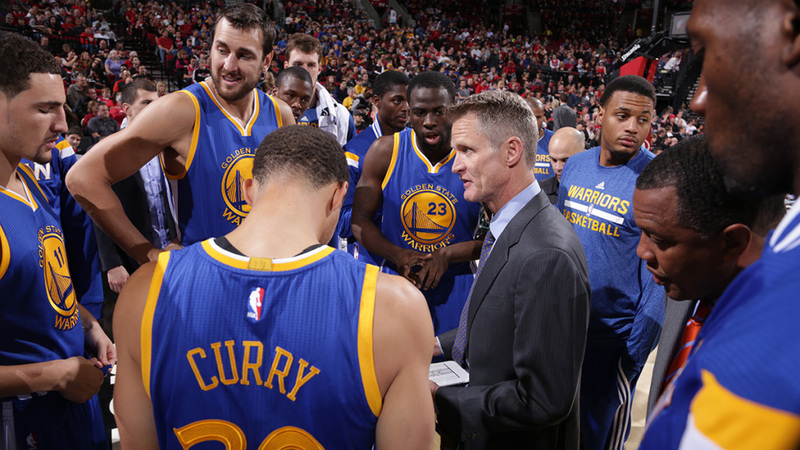 Coming off a fifty win season last year, the Golden State Warriors fired coach Mark Jackson and brought in unproven Steve Kerr. The results have nothing short of amazing. They have been the best team in the league this season, with a 10 game lead over the second place Rockets in the Western Conference – an impressive accomplishment given the strength of the West this year. There are doubtless many reasons for the rise of the Warriors – the MVP caliber play of Stephen Curry, the jumps made by Klay Thompson and Draymond Green, their improved defense, to name a few. But the Warriors brought in Kerr for one reason and one reason only – to fix an offense that ranked 12th in efficiency last season (nearly average! ), despite having the best backcourt in the game. And boy, has Kerr delivered. The Warriors offensive rating currently sits at 111.3, good for third in the league, and their increase by over 4 points represents the third largest increase from last season. The development of key offensive players has certainly played a role in that increase, but I believe it is also fair to say that a large part of the credit can be attributed to Kerr and the offense he has implemented. Last season, the Warriors ranked dead last in pass score and 22nd in run score, a measure of their ball and player movement that I created per SportVu data. Furthermore, it was obvious last season that their offense needed more movement (both of the ball and of players), and that is exactly what Kerr has implemented this season. Looking at the pass and run scores of teams this year, it is clear they have improved. Through Wednesday’s games, the Warriors rank sixth in pass score and third in run score, calculated using the same methods I used last year. They have increased their pass score by the second most of all teams from last season, and their run score by the third most. As I have proven in the past, after controlling for team skill, player movement is correlated with both effective field goal percentage and offensive efficiency, and although there is no causal link proven one could very easily imagine that the increase in ball and player movement, as implemented by Kerr’s new system, could be one source of the improvement of the Warriors offensive efficiency. Of course, the key phrase in the last sentence is “after controlling for team skill.” When forgetting to look at that, it has been nearly impossible to find a link between movement and offensive efficiency. As people like to say, “Jim’s and Joe’s trump X’s and O’s,” and looking at the other teams who greatly changed their pass and run score from last season to now we can clearly see that. For example, the Cleveland Cavaliers drastically decreased their movement scores, but have the largest increase in offensive efficiency, thanks to King James and Kevin Love. On the other hand, the New York Knicks have the greatest increase in both movement scores, but have had an absolutely terrible season this year due starting lineups like the one to the right. 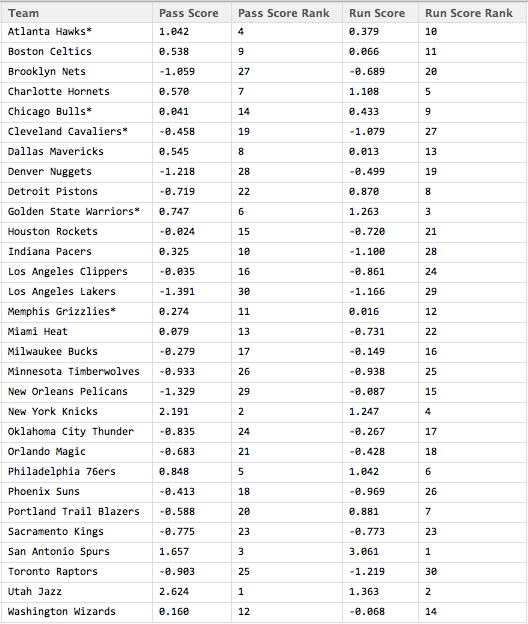 It’s interesting to note that most of the teams who have dramatic changes in their movement scores are lead by rookie coaches. The Warriors, Knicks and Cavaliers all fit these criteria, as do the Pistons (second highest increase in run score), the Jazz (second highest increase in pass score), Lakers (biggest decrease in pass score) and Bucks (second biggest decrease in pass score). This seems to suggest that movement scores are heavily dependent on coaches and the systems they implement, which makes sense. Because the movement scores are so dependent on a coach, it is interesting to think about whether these metrics can be used to determine which coaches should be fired. There are only (nearly) two seasons worth of SportVu data, so it is hard to garner any real insight, but it does seem there might be some connection. Summing up a team’s pass score rank and run score rank we can get a total movement score rank. The bottom five teams in this total movement score last season were (from 26th to 30th): Sacramento, Oklahoma City, Golden State, New York, and Detroit. Three of those teams changed coaches at the end of the season, and Sacramento got rid of their coach after only 24 games into the next season. The final coach, Scott Brooks of Oklahoma City, has been the hot seat for a long time, in part due to accusations about his offense. This year, the bottom five teams in the same order are: Brooklyn, Denver, Minnesota, Toronto, and the Lakers. Denver has already parted way with their coach, and overall I don’t think this is an unreasonable list as to some of the teams whose coach is on the hot seat. The most interesting coach on this list (to me) is Dwayne Casey of Toronto. Although the Raptors currently sit at first in their division, they don’t seem to be improving upon their win total from last year and are only the forth seed in the putrid Eastern Conference. This seems kind of similar to the situation Mark Jackson was in last year with the Warriors: both were around for the same amount of time (3 years for Jackson, 4 now for Casey) and both guided teams from a 23 win season in their first year to the playoffs. The major difference might be that Golden State had a coach (Kerr) that they knew they wanted; it doesn’t seem like there is an as attractive coach out there for the Raptors to pursue. Of course, for the now the relationship between coaches being fired and their total movement score is tenuous at best. We will need at least a few more seasons of the SportVu data before we can run a logistical regression or anything like that. Still, as the season comes to an end and coaches get sacked, this is something to keep in mind. I’d love to see the stats for the last two seasons, what’s the update?